This week I wrote a static tumblelog generator in Perl. It creates a microblog very similar to the well-known tumblelog Anarchaia. The program is available as of today as tumblelog on GitHub. Static means in this case that the HTML files are generated on your computer locally and uploaded to your website. 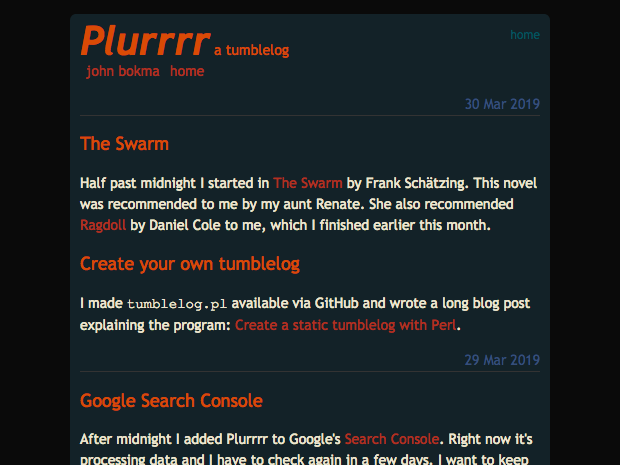 I have my own tumblelog named Plurrrr which is generated using this very program in case you want to look before you leap. The following steps assume you run a recent version of Ubuntu or related. Edit: the program now supports a JSON feed see A JSON feed for tumblelog for the additional required arguments. Variables have to be placed between [% %] and are expanded by the Perl program to their values. All variables, except for body can occur more than once in a single template. Each day will generate a stand-alone HTML page. All entries of a week are collected in week overviews. The main page contains the entries of the last days the number of which can be specified on the command line, see tumblelog.pl --help. Important: use tabs to indent the lines, not spaces.